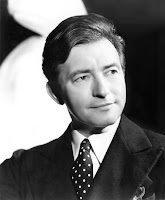 The great Claude Rains will be the September Star of the Month at Turner Classic Movies. TCM will be showing 32 Rains films, which include some of the greatest movies ever made: THE ADVENTURES OF ROBIN HOOD (1938), MR. SMITH GOES TO WASHINGTON (1939), NOTORIOUS (1946), and of course CASABLANCA (1942). The Rains movies will be spread across five Wednesday evenings. The first night, on September 2nd, will showcase four films for which Rains was Oscar nominated -- including one of my oldest daughter's favorite Rains films, MR. SKEFFINGTON (1944), along with MR. SMITH, CASABLANCA, and NOTORIOUS. The same evening TCM will air the FOUR DAUGHTERS series, in which Rains played a music professor who was the widowed father of Priscilla, Rosemary, and Lola Lane, with Gale Page as the fourth daughter. I'm particularly fond of this series, which was reviewed in these posts: FOUR DAUGHTERS (1938), FOUR WIVES (1939), and FOUR MOTHERS (1941). Additionally, TCM is showing the unofficial fourth film in the series, DAUGHTERS COURAGEOUS (1939), which rounded up ten DAUGHTERS cast members for a film in which they play completely different characters. I think it might be my favorite film in the bunch. September 9th is the night for "Heavenly Comedies," the wonderful HERE COMES MR. JORDAN (1941) plus ANGEL ON MY SHOULDER (1946); two Bette Davis films, including NOW, VOYAGER (1942); and KINGS ROW (1942). The 16th features war movies, including PASSAGE TO MARSEILLE (1944); historical dramas such as JUAREZ (1939), in which he plays Napoleon; and a random selection including ANTHONY ADVERSE (1936). On September 23rd the focus is adventure films, starting with THE ADVENTURES OF ROBIN HOOD (1938) and THE SEA HAWK (1940), plus two miscellaneous titles, the California historical drama GOLD IS WHERE YOU FIND IT (1938) and the British film THE PASSIONATE FRIENDS (1949), costarring Ann Todd and Trevor Howard. The final night of the month, September 30th, features courtroom dramas and crime films. THEY WON'T FORGET (1937) is notable for drawing the public's attention to young Lana Turner. THE UNSUSPECTED (1947) is about the producer of a radio crime series carrying off the "perfect crime," with a cast which includes Audrey Totter and Constance Bennett. WHERE DANGER LIVES (1950) is a noir starring Robert Mitchum. A great month ahead for fans of classic films and especially fans of Claude Rains...and who isn't?! Sheila Lukins, coauthor of the classic cookbooks THE SILVER PALATE COOKBOOK and THE NEW BASICS COOKBOOK, passed away yesterday at the age of 66. She had recently suffered from a brain tumor. Lukins was also the food editor of Parade Sunday magazine for nearly two dozen years. Here are obituaries from the New York Times and Associated Press, as well as a memorial page at Amazon. I have both the NEW BASICS COOKBOOK and the SILVER PALATE COOKBOOK 25TH ANNIVERSARY EDITION, and we have enjoyed several of the recipes, including one I mentioned back in the summer of 2007. Lukins once described her role: "The whole idea is to make people feel very comfortable preparing a meal. The best compliment I ever get is that cooking from these recipes is just like having a friend helping you in the kitchen." Lukins' legacy is that although she is now gone, she will continue to be that friend in the kitchen for countless cooks. ...for one night only, on Wednesday, September 23rd. The classic movie will celebrate its 70th anniversary with a high-definition screening in approximately 450 theaters nationwide. The screening will be preceded by a documentary and an introduction by Robert Osborne of Turner Classic Movies. Click the title of this post for the official website where you can locate a theater showing the movie near you. Disney is buying the Marvel Comics empire for $4 billion. The rest of my family are all superhero buffs, which is fine in its place...but I don't want superheroes invading the world of Disney. They should be two separate worlds, and never the twain shall meet. I will not be happy if we start to see superheroes in theme parks or in rides, as seems to be expected. 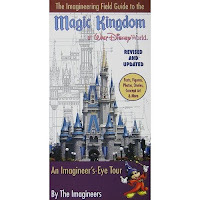 My husband theorizes it's partially a move to add to Disney's Hollywood Studios and Disney's California Adventure. And on the other side of the coin, my superhero buffs are a little worried about how Disney will change Marvel. Additional bad Disney news: MiceAge reports that Michael Jackson's Captain EO will have a return engagement at Disneyland starting in January. Michael Jackson has always creeped me out -- dating back to the early '80s, I would rip off magazine covers when I received them with his face on the front, as I had a sense there was something really wrong with the guy and couldn't stand looking at him. As the years went by and he got weirder and weirder, those bad vibes I felt were increasingly validated. I never saw Captain EO, and I never will. I know there will be those who are excited about this news, but I feel that Disneyland bringing back that attraction to capitalize on his death is tacky in the extreme. Disney should not be celebrating a recently deceased, deeply disturbed child molester and drug abuser to make a buck. Tuesday Update: Kevin Yee of MiceAge analyzes the implications of the Marvel deal. The Orange County Register has more. I've loved musicals virtually my entire life, but until tonight I'd never before seen the Kern-Harburg musical CAN'T HELP SINGING, starring the one and only Deanna Durbin. As I watched it I felt the thrill of discovering something really special for the very first time. Filmed largely on location in the great outdoors, CAN'T HELP SINGING tells the story of Caroline Frost (Durbin), a spirited senator's daughter who runs away from home to follow a calvary officer (David Bruce) west. Along the way Caroline joins forces with Johnny Lawlor (Robert Paige), a card sharp, and as they travel west in a California-bound wagon train Caroline realizes that Johnny is the man for her. The plot isn't much, but it's pleasant, and it's a great excuse to see Deanna Durbin in the only Technicolor musical she ever made. She's absolutely beautiful, and as always she is lively and fun to watch. The fact that it was an outdoor musical, stunningly shot in Utah and California by Woody Bredell and W. Howard Greene, makes it all the better. When you add in a lilting score by Jerome Kern with some clever lyrics by E. Y. Harburg...well, this movie has really been unjustly overlooked in the annals of original film musicals. The movie contains some moments which are pure musical magic, including Deanna singing the title song in a bubble bath, which creatively turns into a duet with leading man Robert Paige. (I was delighted to learn Paige was a singer; I wondered at first if he were dubbed.) Deanna's joyous "Any Moment Now" called to mind Jane Powell's "Wonderful, Wonderful Day" from my favorite film, SEVEN BRIDES FOR SEVEN BROTHERS, a decade later...although lucky Deanna got to sing her song against gorgeous outdoor vistas instead of painted soundstage scenery. 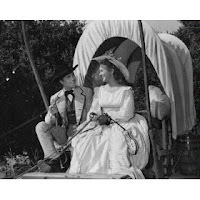 "More and More" is a quiet romantic song which was nominated for the Oscar, and "Californiay" is a terrific group number when the wagon train arrives at its destination. For me, these moments provided movie musical bliss. 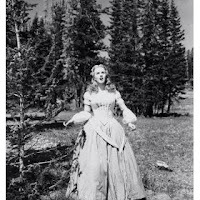 Deanna is the best-dressed pioneer woman in history thanks to the creations of Walter Plunkett, who in 1954 would design the costumes for SEVEN BRIDES FOR SEVEN BROTHERS. In John Kobal's GOTTA SING, GOTTA DANCE, Plunkett shares several anecdotes about working with Deanna, including the explanation for why she wears two different dresses in the final production number; filming was running long and the studio "wanted to cut a sequence. She had two left to shoot and I had designed an elaborate ball gown for each. They didn't know which sequence to cut, and anyway, they had to have her approval. So they hit on the idea of asking her which dress she preferred, and that was going to decide the sequence they would shoot. But Deanna couldn't make up her mind; she liked them both, so for the big musical finale with chorus and all the trimmings, she wore both; first one, then for the next verse the other. Nobody noticed, I don't think, and anyway, that sort of thing is OK in a musical!" The supporting cast includes Akim Tamiroff, Leonid Kinskey, Ray Collins, Thomas Gomez, and Clara Blandick. Many familiar faces, including Olin Howland, Roscoe Ates, Irving Bacon, Nana Bryant, Iron Eyes Cody, Ruby Dandridge, and Glenn Strange, turn up in small roles. CAN'T HELP SINGING was directed by Frank Ryan, who wrote Durbin's 1943 films HERS TO HOLD and THE AMAZING MRS. HOLLIDAY. Sadly, Ryan died in 1947 at the age of 40. Previous reviews of Deanna Durbin movies: FIRST LOVE (1939), HIS BUTLER'S SISTER (1943), NICE GIRL? (1941), FOR THE LOVE OF MARY (1948), BECAUSE OF HIM (1946), MAD ABOUT MUSIC (1938), THE AMAZING MRS. HOLLIDAY (1943), THREE SMART GIRLS (1936), THREE SMART GIRLS GROW UP (1939), and IT STARTED WITH EVE (1941). The year before they costarred in the 1939 classic WUTHERING HEIGHTS, Laurence Olivier and Merle Oberon played opposite each other in a lighthearted British romantic comedy, THE DIVORCE OF LADY X. It's a fun movie with some very witty dialogue and a great period look. Olivier and Oberon are charming; they have great chemistry, and it's a shame they didn't make more movies together. Binnie Barnes costars as the divorce client's real wife, and Morton Selten plays Oberon's grandfather. The film has a very distinctive look, thanks to its designers and color cinematography by Harry Stradling. Stradling was nominated for over a dozen Oscars in his half-century career, winning for THE PICTURE OF DORIAN GRAY (1945) and MY FAIR LADY (1964). The movie begins with the London Films logo, which includes Big Ben, followed by multicolored credits which almost glow neon against the backdrop of Piccadilly Circus at night. (The movie is currently on YouTube; you can see the opening here.) When Olivier leaves the foggy exterior and enters the hotel filled with costumed ball guests, the abrupt explosion of color almost causes the viewer to gasp in delight. The film has a unique color palette; at times the color combinations, such as browns and yellows, are so strange the Technicolor movie looks colorized, but then again combinations such as the blue and green hotel bathroom are both unusual and visually pleasing. THE DIVORCE OF LADY X was directed by Tim Whelan. It runs 92 minutes. The score is by Miklos Rozsa. The movie was recently shown on Turner Classic Movies as part of Merle Oberon Day in the Summer Under the Stars festival. ...Katie from the film site Obscure Classics kindly dropped me a line to let me know the site is gearing back up after a summer hiatus. Look for more posts there in the weeks to come...and in the meantime, if you're new to the site, take a look back at some of the older posts, which are usually beautifully illustrated. Click the title of this post for the link. ...The 1959 version of IMITATION OF LIFE, directed by Douglas Sirk, recently celebrated its 50th anniversary with a screening at the Academy's Samuel Goldwyn Theater. Susan King of the L.A. Times looks back at the movie. I recently picked up a DVD set which contains both this version and the '34 Claudette Colbert version and look forward to watching them. ...There's a new website for classic Columbia films coming to DVD. Among the goodies coming in the next few months: a Rita Hayworth set and a "Bad Girls of Noir" set spotlighting some of the restored films shown at UCLA last year. ...Catherine Zeta-Jones heads to Broadway to star in A LITTLE NIGHT MUSIC. ...Al Lutz of MiceAge says it's likely the new version of Star Tours will be announced at the upcoming D23 Expo... Another bit of news that caught my interest was a proposal to create attraction posters for Disney's California Adventure. ...Some of the best of this week's conservative political commentary: Victor Davis Hanson on "Obama and 'Redistributive Change'"; Betsy McCaughey on "Obama's Health Rationer in Chief" (forget that darn old Hippocratic Oath! ); and David Limbaugh on "Reclaiming Popular Sovereignty." 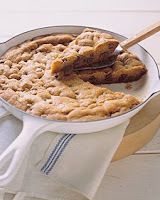 ...The Everyday Food site has a great-looking recipe for a Skillet-Baked Chocolate Chip Cookie. The accompanying photo is also from the Everyday Food site. It's one of my favorite magazines. ...A notable passing this week was writer/crime reporter Dominick Dunne, who also once worked in TV and film production. ...Over at MousePlanet, Wade Sampson looks back at the ceremony honoring the very first Disney Legend, Fred MacMurray. 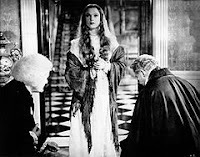 Decades before this year's THE YOUNG VICTORIA or other depictions of the life of the British queen, there was the 1937 British film VICTORIA THE GREAT. VICTORIA THE GREAT stars Anna Neagle in the title role, with Anton Walbrook (THE LIFE AND DEATH OF COLONEL BLIMP) as Prince Albert. Neagle, who ages from lovely teenager to elderly widow in the role, captures both Victoria's regal imperiousness and her increasing devotion to Prince Albert, while Walbrook also does well as the young German prince who gradually becomes Victoria's most trusted and reliable advisor. The first half of VICTORIA THE GREAT covers much the same ground as this year's film (reviewed here and here), and it's very interesting to compare how the two films treat many of the same incidents, whether it's Victoria being informed she has ascended to the throne, the young Queen bathing her beloved dog on Coronation Day, or an attempt on Victoria's life when she and Albert are out for a drive. The depiction of Victoria and Albert's courtship is somewhat truncated and focuses more on their initial awkward relationship than on their romance, but that aspect comes into full bloom in the depiction of their marriage. The film curiously skips over the birth of Victoria and Albert's firstborn child, Victoria, the Princess Royal, and goes straight to the birth of Edward, Prince of Wales; although the movie spans many years, the infant prince and later a young Princess Alice are the only two of Victoria and Albert's nine children depicted in the film. The story leaps through the decades, contenting itself with simply mentioning historic events such as Prince Albert's triumphant Great Exhibition. The film does depict Albert's role, not long before his death, in preventing war between England and the United States as a result of the Trent Affair. After Albert's death -- the details of which are fictionalized -- the film moves on to Victoria's years in mourning, the expansion of the empire, and climaxes with her Diamond Jubilee. Although the movie was shot in black and white, originally the final Diamond Jubilee sequence was in Technicolor; however, the DVD print I watched showed these scenes in black and white. The stirring choral music during this sequence is gorgeous and provides a fitting ending to the movie. H.B. Warner, a regular in Frank Capra's movies, here plays Victoria's mentor, Lord Melbourne. It's interesting to compare Warner's interpretation with the more dashing version essayed by Paul Bettany in the recent film. The cast also includes Mary Morris as the Duchess of Kent, Charles Carson as Sir Robert Peel, Walter Rilla as Prince Ernest of Coburg, Felix Aylmer as Lord Palmerston, and Gordon McLeod as John Brown. A card at the start of the film lists many of the royal homes where the movie was filmed, but it is unclear to me whether these locations were just used for establishing shots or whether filming also took place in any of the interiors. Shots of Victoria on the balcony of Buckingham Palace seemed to have been filmed on a soundstage. The movie also filmed some of the royal coaches and a historic train. VICTORIA THE GREAT was produced and directed by Herbert Wilcox, Anna Neagle's husband and longtime collaborator. The DVD ran 106 minutes; IMDb gives the run time as 112 minutes and Leonard Maltin's Classic Film Guide lists 118 minutes. The following year a Technicolor remake/sequel was released, SIXTY GLORIOUS YEARS, also known in the United States as QUEEN OF DESTINY. It again starred Neagle and Walbrook as Victoria and Albert. I haven't yet seen this film but it appears to retell some of VICTORIA THE GREAT, this time with the advantage of Technicolor, while also introducing new historical characters, such as the Duke of Wellington (Sir C. Aubrey Smith), the Princess Royal (Pamela Standish), and Florence Nightingale (Joyce Bland). A side note, years later Neagle would play Nightingale herself in THE LADY WITH THE LAMP (1951). VICTORIA THE GREAT is not available on DVD in the United States. I was able to watch the film thanks to my recently acquired "all-region" DVD player; the movie is available in Europe in the Region 2 PAL DVD format as part of the six-film Anna Neagle Collection. The other films in the set are described in a previous post. The movie also appears to have had a U.S. videotape release from Nostalgia Home Video. Longtime Southern Californians and visitors to Knott's Berry Farm may remember a fascinating multi-dial clock which was displayed at Knott's for over half a century. At one point it stood in the Rose Garden, and it also spent time near the ticket booths. That clock was built by Andrew Dreger Sr., the great-grandfather of a family friend, Glenn Frank, who discovered a while back that the clock had fallen into disrepair and been warehoused by Knott's. Glenn has been working ever since to have the clock restored and displayed once more in a prominent place in Buena Park. The Buena Park Historical Society has played a key role in this effort, purchasing the Dreger Clock for restoration. The work has paid off and on October 3, 2009, a dedication ceremony will be held at the clock's new home at 6631 Beach Boulevard, across the street from City Hall. 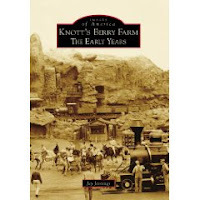 By coincidence, I learned today about a new book in the great Images of America series, KNOTT'S BERRY FARM: THE EARLY YEARS by Jay Jennings. As it happens, Glenn mentions at the Dreger Clock website that Jay sent him a photo of the clock. Jay's website is The Knott's Berry Farm Museum. I'll definitely be checking out his book. Terrific news today regarding the film department at the Los Angeles County Museum of Art, which was scheduled to close in the near future. The Hollywood Foreign Press Association (which sponsors the Golden Globe Awards) and Time Warner Cable have each made donations which will enable the film program to continue through at least the middle of 2010. Additionally, Time Warner and Ovation TV have pledged substantial assistance with marketing and publicity -- an area which some observers of the film program have noted needs improvement. I haven't been very happy with Time Warner since they "upgraded" us to their awful new Navigator DVR system -- in fact, we are very likely to make the switch to Verizon TV soon precisely because of the poor performance of the DVR -- but in this instance they deserve to be commended for making an important contribution to classic films and the Southern California cultural scene. I believe the decision of the museum head, Mr. Govan, to shutter the film department of the most prominent art museum in Los Angeles, of all places...!...still needs to be seriously questioned. What were his priorities for the museum, and why? Was this a flashy ploy to achieve donations? Hmmmm. All in all, though, very good news today. The groundbreaking drama THIRTYSOMETHING came out on DVD yesterday. The extras include featurettes and commentary tracks for nine episodes. The set also includes a beautifully produced 40-page booklet of essays and episode credits. The show started around the same month we became homeowners, and by the end of the first season we were expecting our first child, so I could really relate to the "small" issues of family life discussed on the show each week, even though at the time I was still a few years away from turning "thirtysomething." I've been curious how well the series will hold up twenty years later -- aside from some of the bad fashions and "big hair." A National Public Radio reviewer took a look back and opines "...it's actually quite affecting, even 20 years later...I wasn't expecting to have much patience for this show, which I remembered as a sort of self-congratulatory salute to how very special and important and challenging it is to own a house and raise a baby. It doesn't much play that way, though. It plays as a show that takes ordinary feelings seriously..."
The Washington Post notes that the kind of discussions which were "groundbreaking" in the late '80s seem fairly "standard" -- but "still compelling" -- viewed from today. I can't help thinking, though, that in this age of endless reality TV shows, prime time could sure use more substantive, well-crafted dramas like THIRTYSOMETHING, even if honest discussion of daily life has become normal TV fare. The Post: "It still works remarkably well as a piece of relatable, well-acted and adult television." Fans of the show might be interested in THIRTYSOMETHING STORIES, which published nine of the show's best scripts in one volume. It includes two of my favorite episodes, "The Mike Van Dyke Show," in which Michael reimagines his life as a '60s comedy, and "New Baby," in which the birth of Gary and Susannah's baby was told in a time chronology which went backwards rather than forwards. The soundtrack came out when I was in the no man's land between LP's and CD's -- new house and baby, no money for a CD player! -- but I got it on cassette. The guitar theme music can also be heard on MUSIC BY...W.G. SNUFFY WALDEN, along with the great theme music Walden wrote for THE WEST WING. Previously: April 19, 2006, April 29, 2009, and August 15, 2009. Update: Laudatory reviews from DVD Verdict and Digitally Obsessed. MILLION DOLLAR BABY opens with Harry Warren's jaunty "I Found a Million Dollar Baby in a Five and Ten Cent Store" playing over the opening credits, and from there on it continues to provide an entertaining viewing experience. The movie reunites a few members of the cast of FOUR DAUGHTERS (1938). Wealthy Cornelia Wheelwright (May Robson) learns that decades previously, her father had cheated a business partner. Although the statute of limitations has passed, Cornelia determines to make restitution to the partner's granddaughter, with the help of attorney Jim Amory (Jeffrey Lynn). The granddaughter, Pamela (Priscilla Lane), is a dime stork clerk whose life is turned upside down when she receives a check for a million dollars. MILLION DOLLAR BABY is one of countless movies from Hollywood's Golden Age which isn't particularly remembered today, but it's the kind of well-crafted light diversion which the studio system of the era could turn out on a regular basis. Lane and Lynn were regular costars; in addition to MILLION DOLLAR BABY and the three films in the FOUR DAUGHTERS series, they appeared together in three films released in 1939: YES, MY DARLING DAUGHTER, DAUGHTERS COURAGEOUS, and THE ROARING TWENTIES. 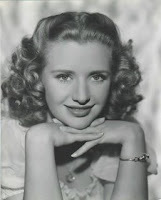 I've now seen at least half of Priscilla Lane's 22 movies, and she's always an enjoyable leading lady, who mixes sweetness and sincerity with a dash of sauciness and determination. This was one of several films handsome Jeffrey Lynn appeared which were in released in 1941, but his career was cut short by WWII service and after 1941 he was absent from the screen for the next seven years. His most notable postwar movies were Deanna Durbin's final film, FOR THE LOVE OF MARY (1948), and the classic A LETTER TO THREE WIVES (1949). Most of his postwar career was in television. The movie has a solid supporting cast, starting with Ronald Reagan as Pam's pianist boyfriend. Residents at Pam's boarding house include Helen Westley, Lee Patrick, John Qualen, and Johnny Sheffield (TARZAN). The cast also includes George Barbier, Walter Catlett, Nella Walker, Herb Vigran, Pedro de Cordoba, and John Ridgely. Joan Leslie's older sister, Mary Brodel, is credited with a bit part by IMDb. The band singer is played by Nan Wynn; you can read more about her in my post on PRINCESS O'ROURKE (1943). This film runs 100 minutes. It was shot in black and white by Charles Rosher. Rosher would go on to do remarkable Technicolor work at MGM on films such as YOLANDA AND THE THIEF (1945) and SCARAMOUCHE (1952). He was a two-time Oscar winner, for SUNRISE (1927) and THE YEARLING (1947), and was nominated four more times, including for SHOW BOAT (1951). MILLION DOLLAR BABY was directed by Curtis Bernhardt. His films include MY LOVE CAME BACK (1940), which starred Jeffrey Lynn, MY REPUTATION (1946), and HIGH WALL (1947). MILLION DOLLAR BABY has not had a VHS or DVD release. It can be seen on Turner Classic Movies, where it next airs as part of a run of Million Dollar Comedies on September 11, 2009. The other titles being shown that night are BREWSTER'S MILLIONS, MAN WITH A MILLION, and ALWAYS TOGETHER. Yesterday's L.A. Times published an article about Disney modeling the Expo on Comic-Con, which a couple members of my family are hoping to visit next year. The Hollywood Chamber of Commerce will be presenting the University of Southern California School of Cinematic Arts with its own star on September 10, 2009. The School of Cinematic Arts was founded by Douglas Fairbanks Sr. in 1929. The star is being presented to the school "on its 80th anniversary in recognition of its accomplishments in educating and encouraging its students to explore and expand the power and potential of film, television and interactive media." This has been a weekend for "girl" movie titles, starting with WISE GIRL (1937) Friday evening and continuing with THE RICHEST GIRL IN THE WORLD (1934) last night. Tonight the weekend drew to a close with THE GIRL FROM JONES BEACH, starring Ronald Reagan, Virginia Mayo, and Eddie Bracken. The seaside theme makes it perfect entertainment as the month of August draws to a close. Bob Randolph (Reagan) is an artist famous for his paintings of "The Randolph Girl," who is actually a composite of a dozen women. Bob is financially strapped and needs a single Randolph Girl in order to land a lucrative TV contract, and PR guy Chuck (Eddie Bracken) spots a perfect candidate, Ruth (Virginia Mayo), on Jones Beach. However, Ruth is a teacher who wants to be appreciated for her mind. Bob goes to great lengths to become friendly with Ruth in hopes of interesting her in being the Randolph Girl, but Ruth loses her job when she's photographed in her swimsuit without Bob's knowledge. The film climaxes with a courtroom showdown which will decide Ruth's career and her romantic future. THE GIRL FROM JONES BEACH is a fun light comedy. In the early scenes there's a bit too much of Eddie Bracken, whose comedy style I find tiresome, but the two leads are charming and the film tilts toward focusing on them more as the film progresses. The script by I.A.L. Diamond -- who would go on to write several comedy classics -- is above average, including a couple clever scenes where Bob and Ruth toss famous quotations back and forth at each other. The film also benefits from an excellent cast. The film has two personable supporting actresses, with wisecracking Helen Westcott (THE GUNFIGHTER) playing Reagan's secretary and lively Dona Drake playing Bracken's girlfriend. The cast also includes Lois Wilson and Gary Gray as Mayo's mother and brother. Jerome Cowan, Henry Travers, Florence Bates, and Lloyd Corrigan are also in the film. The models include Myrna Dell (seen recently in ROUGHSHOD, released the same year), Lola Albright, Joan Vohs, and Joi Lansing. Watch carefully when Dona Drake meets Bracken at the beach, accompanied by two lifeguards. The lifeguards are Dale Robertson and Jeff Richards (Benjamin in SEVEN BRIDES FOR SEVEN BROTHERS). THE GIRL FROM JONES BEACH was directed by Peter Godfrey. It runs a quick 78 minutes. This film has not had a DVD or video release, but it can be seen on Turner Classic Movies, where it next airs November 30, 2009. The trailer can be seen here. Update: This film is now available on DVD from the Warner Archive. My review of the DVD is here. Turner Classic Movies showed a number of Miriam Hopkins films earlier this week, including WISE GIRL (1937), which I watched last evening. However, the Hopkins movie I was really looking forward to seeing for the first time was THE RICHEST GIRL IN THE WORLD, costarring Joel McCrea. It proved to be as much fun as hoped. Super-wealthy Dorothy Hunter (Hopkins) has spent her entire life living out of sight of the press, protected by her guardian (Henry Stephenson); Dorothy's devoted friend Sylvia (Fay Wray) poses as Dorothy in public. However, Sylvia has married Phil (Reginald Denny) and is ready for the charade to end so she can move to England with her husband. Dorothy meets Tony (McCrea) and hopes he'll love her for herself and not her money, so she asks Sylvia to switch places and become "Dorothy" one final time so that she can find out who Tony truly loves. Hopkins and McCrea were frequent costars in the mid-'30s in films such as BARBARY COAST (1935), THESE THREE (1936), and WOMAN CHASES MAN (1937). They are two of Hollywood's greats who are always an enjoyable team. I especially liked Reginald Denny and Fay Wray as Phil and Sylvia. Reginald Denny as a romantic second lead -- who knew? He was quite charming as Sylvia's besotted bridegroom, and Wray was equally fun in her dual role. Speaking of "Who knew?" -- check out Denny's fascinating biography at IMDb. He had a second career as a pioneer in remote-controlled model aircraft and helped invent the first drones used by the U.S. Army; one of his companies eventually became part of Northrop. You can read more about this at ModelAircraft.org. Another amazing site has wonderful photos of the hobby shop he owned on Hollywood Boulevard, as well as pics of Robert Montgomery with his "Dennyplane." The site's homepage is here. I have a lot more reading to do on this topic! What a fascinating piece of aviation and movie history. Henry Stephenson, who plays Dorothy's guardian, is a plus in any movie he's in. The cast also includes Beryl Mercer, George Meeker, and Edgar Norton. Norman Krasna was Oscar-nominated for his creative story, which was used again a decade later as BRIDE BY MISTAKE. I enjoyed and reviewed the remake a couple of years ago. Laraine Day and Alan Marshal played the leads; once again I particularly enjoyed the second leads, played that time around by Marsha Hunt and Allyn Joslyn. THE RICHEST GIRL IN THE WORLD was directed by William A. Seiter, who went on to direct a number of Shirley Temple and Deanna Durbin movies. The movie has the usual swank RKO '30s look, designed by Van Nest Polglase and his team. The movie was shot in black and white and runs a fast-paced 76 minutes. It has not had a video or DVD release. April 2017 Update: THE RICHEST GIRL IN THE WORLD is now available on DVD from the Warner Archive. March 2019 Update: I had the chance to see a 16mm print of this film on a big screen at UCLA's Billy Wilder Theater. 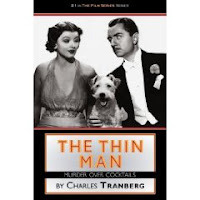 ...THE THIN MAN: MURDER OVER COCKTAILS is an interesting book I just came across. (Click the title of this post.) It was published last year and is a survey of all the films in the series. The author is Charles Tranberg, author of a well-received biography of Fred MacMurray. 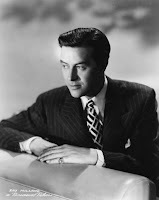 Tranberg is working on a biography of Robert Taylor due in 2010. ...Interested in making Julia Child's Beef Bourguignonne, spotlighted in JULIE AND JULIA? The EVERYDAY FOOD website has posted an adaptation. Or you can go straight to Child's MASTERING THE ART OF FRENCH COOKING, VOLUME 1. ...Dave Kehr of the New York Times reviewed the new DVD sets of Columbia Screwball Comedies earlier this month. ...One more interesting Disney bit, an informative article by Wade Sampson on the development of the three good fairies in SLEEPING BEAUTY (1959), posted at MousePlanet. ...The Wall Street Journal makes the case for ending the Postal Service's monopoly. ...Has anyone seen MILLIONS LIKE US (1943), a British WWII film with Patricia Roc, Gordon Jackson, and Megs Jenkins? It looks interesting. ...Glenn Erickson of DVD Savant really likes the Julia Roberts film DUPLICITY, which has just come out on DVD. He compares it to great titles like CHARADE and TROUBLE IN PARADISE. I hope to see it soon. ...Political commentary: Fred Barnes on "Death of a Salesman." ...Moira Finnie shares interesting thoughts on John Wayne's THREE FACES WEST (1940). And if you haven't already done so, be sure to read her great profile of Glenn Ford from earlier this month. It has a wonderful shot of him in SUPERMAN (1978), one of his best -- if shortest -- performances, which I mentioned at the time of his passing in 2006. WISE GIRL is a brisk 71-minute RKO comedy which finds wealthy Miriam Hopkins moving into a bohemian Greenwich Village community in order to track down her late sister's children. The children are living with their paternal uncle, starving artist Ray Milland. This being a '30s comedy, once Hopkins and Milland meet can love be far behind? It's not an especially great movie, but it has a number of things going for it, including the usual excellent RKO production values. Hopkins' mansion and the Greenwich Village apartment building are each beautiful to look at; the apartment building, centered around a courtyard, is particularly interesting. Hopkins and Milland play their roles with verve; Hopkins has a particularly amusing bathtub scene and another very funny scene acting in a department store window "commercial" of sorts. The young and handsome Milland has a good scene selling vacuum cleaners door to door. The leads are ably supported by Henry Stephenson, Guinn "Big Boy" Williams, Walter Abel, Margaret Dumont, and Leonid Kinskey. This was the only film credit for Betty Philson and Marianna Strelby, who play Hopkins and Milland's nieces. WISE GIRL was directed by Leigh Jason. It was filmed in black and white by J. Peverell Marley, who at one time was married to Linda Darnell. Among his many credits are MOON OVER MIAMI (1941) and PRIDE OF THE MARINES (1945). 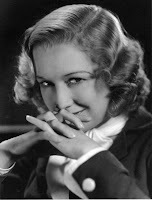 WISE GIRL can be seen on Turner Classic Movies, where it was recently shown on Miriam Hopkins Day in the annual Summer Under the Stars festival. It has not had a video or DVD release. Yesterday was the official move-in day at the University of Southern California, but today was the day our daughter moved back up to her dorm. Has it really been three months already since she returned from her semester in London? It's good to see Tommy Trojan again! In the background is Bovard Auditorium, seen in countless movies and TV shows. The plaque below the Fairbanks statue reads "Douglas Fairbanks founded the USC Cinema program when President of the Academy of Motion Picture Arts and Sciences, 1929." The original faculty included William DeMille, D.W. Griffith, Irving Thalberg, and Ernst Lubitsch. The lists of contributors to the Cinema School are rather interesting for those who appreciate film history. (Click to enlarge and read.) For instance, John Hench is a Disney Legend who worked for Disney for over 65 years. It hardly seems possible that our daughter is starting her senior year. Wasn't it just her very first move-in day? Or second or third? It goes so quickly. A proud parental note: our daughter enters her senior year as a member of Phi Beta Kappa and has been certified as a candidate to be named a USC Renaissance Scholar at graduation, based on both her GPA and the diversity of her studies in history, geology, and cinema. She works very hard and has had a fantastic experience at USC. Update: The annual U.S. News and World Report college rankings are out today, and USC has continued its steady rise, moving up to No. 26 on the list.